High Quality Content by WIKIPEDIA articles! 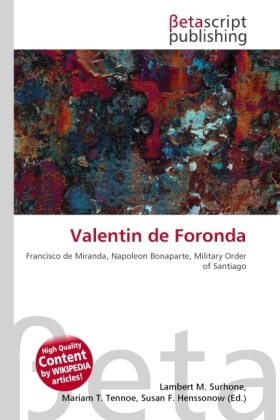 Valentin de Foronda y González de Echávarri, (Vitoria, 14 February 1751 24 December 1821), was Spanish General Consul in Philadelphia from 1801 to 1807 and Spanish Plenipotentiary Minister in the U.S.A. from 1807 to 1809 tense times because of American ship's lack of discipline in trading with Cuba and the U.S.A.'s support for Francisco de Miranda who led an attempted revolution for Venezuelan independence from Spain. He returned back to Spain upon the arrival of Luis Onís, who replaced him, and who was nominated by the "Junta Patriótica" opposed to the invaion of Spain by Napoleon Bonaparte.